Home»Articles»Traffic Rules and Traffic Violations»Can Your Car’s Tinted Glass Get You In Trouble? Mr. Banerjee had recently moved to Mumbai from Shimla for official work. It was summer, Mr. Banerjee and his family started feeling the heat even when they moved around the city in their air-conditioned car. In order to beat the heat, he decided to add a sun film to his car’s window. He had purchased the car from Mumbai itself. As it did not feature a tinted glass, he went to a local garage and got a sun film added to his car’s windows. Later, when he took his family for a day out, the sun film did its job and reduced the harshness of the sun’s rays for the passengers seated in the car. However, Mr. Banerjee was in for a surprise when he got pulled over by the traffic police. He had to pay a hefty traffic penalty for the dark sun foil on his car. The official informed Mr. Banerjee that such type of car modifications are illegal in India and handed him a traffic police challan. Tinted glass is any glass that is treated with a material to minimize the transmission of light through it. In vehicles, it is mainly used to avoid excess heat and block the sun’s rays. Generally, vehicles do not come with built-in tinted glass in India. What is a Sun Foil? A sun foil is a layer added to the glass which gives it a tint and reduces the transmission of light and heat through it. Car owners usually add a sun foil to the car’s windows which does not feature tinted glass. It is usually added to keep the car’s interiors safe from the sun’s rays. What are the Benefits of Tinted Glass/Sun Foil on Car’s Windows? Harsh sun rays can damage a car’s interiors (For example – upholstery, leather, etc.) in the long run. Tinted glass/sun foil protects the car’s interiors and enhances its shelf life. Tinted glass/sun foil blocks the sun’s UV rays. UV rays can have adverse effects on the skin. Tinted glass/sun foil lessens the effect of heat and along with the car’s air conditioning, helps to keep the car’s temperature pleasant. Tinted glass/sun foil makes it slightly difficult for the glass to shatter in case of an accident. Prying eyes can’t see through the car’s window if it has a tinted glass/sun foil. The law states that any sort of additions made to the car’s windows will attract a traffic police challan. Rule 100 of Central Motor Vehicle Rules, 1989 states that the window of a car must have a minimum visibility of 50%. Blocking the window of a car with sun shades is also not allowed. 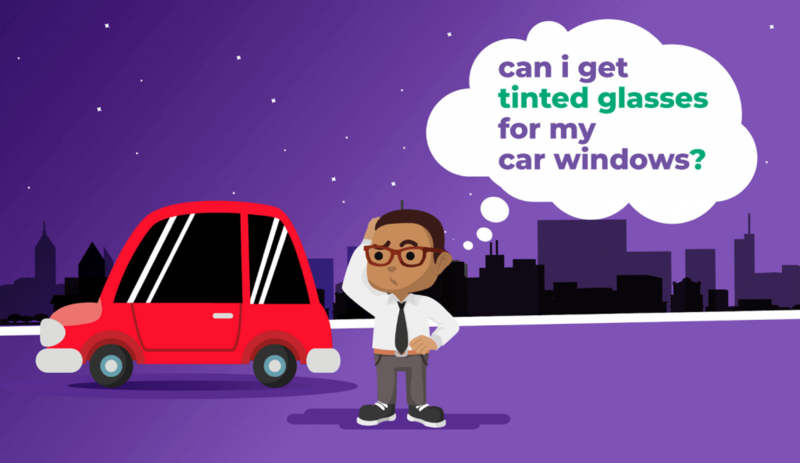 If the car’s manufacturer has designed the car with tinted glass, then it is permitted. Any sort of modification, such as adding a sun film is not allowed. There is a provision for high profile people’s cars to use dark glasses for security reasons. However, appropriate permissions need to be taken from the Home ministry and the police authorities in order to do that. This rule is directed towards public safety as the use of dark glasses in cars has been linked to some criminal activities and social evils. Thus, it is an illegal offense if the said rule is not followed. Unless you are someone with a Z or Z+ security cover, you cannot use dark films on your car’s windows for security reasons.